The name of at least one faculty adviser who is willing to assist students in planning a program of work and annual initiations. A group of two or three advisers to share the responsibility is ideal but not required. The total number of qualified candidates for membership (second semester sophomores, juniors, and seniors who rank in the upper 25% of the class in the unit. Candidates from any program within the chapter's home college are eligible if the students and faculty agree that membership would be beneficial for the individual program(s). 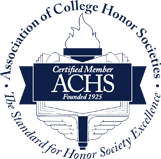 Students in online-only programs within the chapter's unit(s) are also eligible for membership. Conduct initiation, including an educational speaker. Advisor commitment to file timely information, forms, and initiation fees with national via kon.org/advisers. National office will supply the authorized adviser(s) with the necessary login information on approval of reactivation. We will also apply for and provide you with a tax ID number that will allow you to open a bank account for the chapter. Conduct a meeting to orient officers and members to Kappa Omicron Nu and plan for the rest of the year. At a minimum, each chapter year should include a Fall and/or Spring Initiation (with an educational presentation) and one additional educational event (something to focus on leadership, research, graduate study, social responsibility, etc.). If you need anything further, a wealth of chapter forms and resources (including Tips for Successful Chapters in the chapter handbook, the officer's handbook, and much more) are available at http://kon.org/chapter_files/chapter-advisers.html, or you can contact us at info@kon.org and we will be pleased to assist.